In the world of games, a month is a long time. A year is an eternity, and ten years is an almost incomprehensible figure. But that’s how long Iconoclasts has been in development, a hugely ambitious solo project by jack-of-all-trades indie developer Joakim ‘Konjak’ Sandberg. Not to say that this is the only thing he’s worked on in that time; he also developed multiplatform indie hit Noitu Love 2, as well as contributed to some high-profile titles such as Contra 4, but this is his passion project. 2018 has only just begun, and we’re already seeing exciting games launching. Here’s some others to keep an eye on over the coming months. 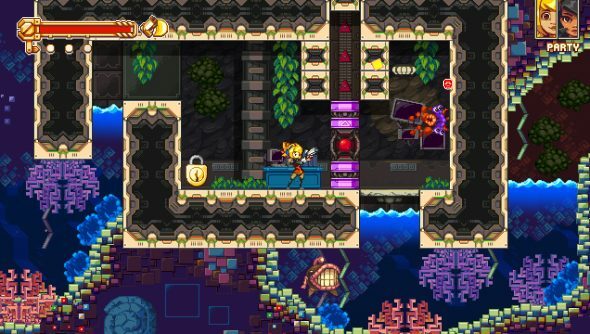 I’ve been following the development of Iconoclasts for most of the past decade, and have now got my hands on a review copy of the game. While I’ve only played through the first couple levels, I can already say that this is set to be something quite special. Set in a strange world where a technologist religion runs everything (including assigning jobs to people) and where any divergence from your given path is punished by divine mechanical forces lurking deep within the earth, you play as Robin, a young freelance mechanic who inadvertently stumbles into a quest to unveil the nature of her world. While the dialogue thusfar has a slightly off-kilter edge to it, as if written in fluent english but delivered with a slight foreign edge, the story seems genuinely creative and the characters fun, and I can’t wait to dig deeper later tonight. What really makes Iconoclasts stand out is just how smoothly everything flows. While things do slow down for exposition here and there, the action out in the wilds is almost wordless and emphasises mastery of the control, with a well timed hop, skip, jump wrench-grapple allowing fluid movement from one ledge to another almost without pause. The combat is simple and satisfying so far as well, and while I don’t doubt it’ll become more complex over time, I don’t think I’ll ever get bored of the immensely satisfying dive-kick attack, which causes enemy sprites to squash flat before exploding spectacularly. In addition to the press, a few choice streamers and YouTubers have recieved a more limited version of the game which cuts off after a few levels. You can watch streamer TieTuesday (a personal recommendation) playing through the first couple hours of the game here, as recorded last night. Iconoclasts is out on January 23rd, just over a week from now, and you can wishlist it on Steam.In the meantime, you can check out an early prototype build of the game, as well as Ivory Springs – the decade-old precursor of the design – on Konjak’s site here.